Product prices and availability are accurate as of 2019-04-21 09:22:51 EDT and are subject to change. Any price and availability information displayed on http://www.amazon.com/ at the time of purchase will apply to the purchase of this product. 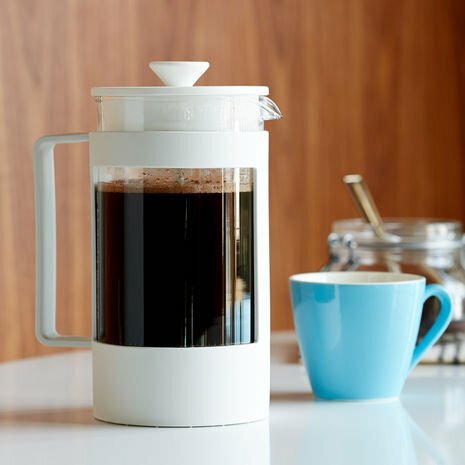 An 8-cup coffee press made with 50% post-consumer plastic. More flavorful coffee, better for the planet. For those who love great coffee. The coffee press has always been one of the most flavorful ways to brew coffee, and this 8-cup coffee press with the fresh white color is composed of 50% recycled materials, so using it feels just as great as the coffee tastes. It's the greener way to enjoy the coffee you love. Dishwasher safe. Coffee scoop included.